Custom parts manufacturer provides technical expertise and meets stringent deadlines, offering relief for MWES. When designing one of their three robotic welding positioners, the Skyhook system, Midwest Engineered Systems Inc. became frustrated due to the lack of responsiveness they were receiving from a number of the parts manufacturers they were consulting with. 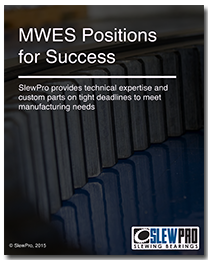 SlewPro however was willing to do what it needed to in order to assist MWES with their needs, including a quick delivery of vital bearings and pinions. Following the success of the Skyhook partnership, MWES and SlewPro have continued their engagement on a number of other projects. Fill out the form to download a printable version of the case study. © 2017 Potesta & Company, LLC. All Rights Reserved.